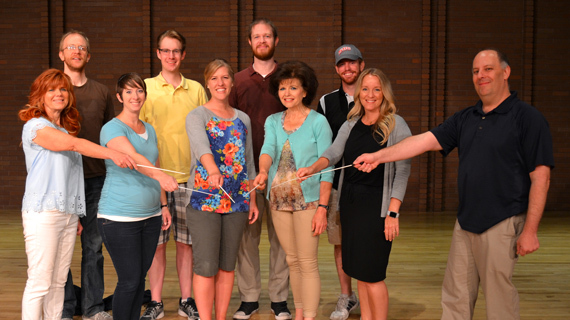 SUU's Master of Music Education program was named one of the Best Master's In Music Education Programs for 2019 in the country by OnlineMasters.com. SUU was ranked 25th of 36 programs that were selected. SUU's Master of Music Education is a 30-credit graduate program designed specifically for current school ensemble directors who want to continue working while obtaining their degree. Teachers utilize their classrooms as experimental laboratories while they master best practices, broaden their pedagogy, and grow as artists themselves. Students meet at SUU for a three week on-campus sessions in June, then complete the bulk of their course work online throughout the school year, tailored to match the schedules of busy teachers. With over 1/3 of the degree being electives and individualized projects, they can improve on the skills that they truly want to master. Dr. Lawrence Johnson, Chair of the Department of Music, shares, "To receive these accolades on a national level gives further credence to SUU's motto, ‘Learning Lives Forever’, and demonstrates the music department's commitment to helping graduate students continue their learning and dedication to their professions as music educators. Dr. Herb is to be lauded for guiding the incipient Master of Music Education program on such a successful path already. Kudos also go out to all those faculty who help and support this thriving graduate music curriculum, which is sure to continue its growing momentum!" Also on the website under Best Online Masters in Music Programs was SUU’s Master of Music in Music Technology. It was listed as 9th of 32 programs and had the honor of Best of Studio Careers. Congratulations to SUU’s Department of Music Masters programs for this incredible honor. The College of Performing and Visual Arts (CPVA) at Southern Utah University comprises 26 academic programs including liberal arts (BA/BS) and professional (BFA, BM) degrees in art, design, dance, music and theatre. It includes graduate programs in the fields of arts administration (MFA, MA), music education (MME), and music technology (MM). More than 60 full-time faculty and staff are engaged in teaching and mentoring nearly 700 majors in the College. CPVA presents over 100 performances, lectures, presentations, and exhibitions each year and is affiliated with the Southern Utah Museum of Art (SUMA), Utah Shakespeare Festival, and the Center for Shakespeare Studies. Southern Utah University is an accredited member of the National Association of Schools of Art & Design (NASAD), National Association of Schools of Dance (NASD), and the National Association of Schools of Music (NASM). For more information about the College of Performing and Visual Arts, visit www.suu.edu/pva.